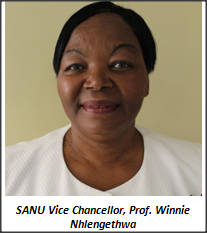 Vice Chancellor of Southern Africa Nazarene University, Professor Winnie Nhlengethwa has said that SANU is committed to offering quality Christian Higher Education that matches global standards to produce transformational leaders who can effectively impact communities across the globe. She said this when she was welcoming the Global Library and IT Team who are in the University to implement Library and Student Management Systems. These are Professionals coming from different institutions of the Church of the Nazarene representing six (6) higher education institutions from United States of America, Great Britain, Malawi and South Africa. During her welcome remarks, Prof. Nhlengethwa said that the implementation of these two projects is a result of a dream of over 10 years when this need was presented to the International Board of Education (IBOE) of the Church of the Nazarene. The leader of the delegation is Dr. Tammy Condon who is Program Coordinator for Strategic Projects at IBOE. She also provides oversight on the development of the student management system. Assisting Dr. Tammy is Sharon Bull who is the Dean of Academic Services & Library Director at Northwest Nazarene University. Speaking on behalf of the arriving team, Tammy Condon extended her appreciation to the Vice Chancellor for being visionary in allowing SANU to pilot the OPALS and OpenCUAS systems. OPALS stand for Open Source Automated Library System . OpenCUAS stands forOpen Community University Administrative System. She said that the International Board of Education in support of the institutions of the Church in Africa, procured both the library and student management systems software and supplies. 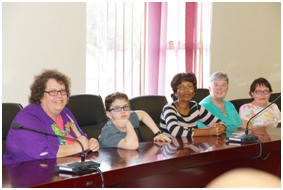 The support is coupled with training of the Librarians at SANU, Malawi Theological College and the Nazarene Theological College (NTC) in South Africa. Once the systems are set up and running, this will allow the University to offer continuing education courses online. In response to the demand for distance and part-time education, the University is working on establishing a Continuing Education Centre (CEC). 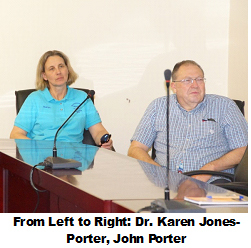 The Dr Karen Jones-Porter is joining SANU as the Director for Continuing Educationwith her husband Rev. John Porter. The couple forms a strategic team to drive the establishment and roll-out of the continuing education programme. Rev. John will also assist in the establishment of the University Advancement and Church Relations Department in the University. Dr. Karen is an Adjunct Associate Professor at Northwest Nazarene University, teaching Master of Business Administration courses. She also teaches at Trevecca Nazarene University in the Masters of Organizational Leadership Programme. Dr Karen has also been a Director of Adult & Professional Programmes at Northwest Nazarene University from 2009 to 2012. She holds a Doctorate of Management in Organizational Leadership, Master of Arts in Missiology, Master of Business Administration and a Bachelor of Science in Cross-Cultural Communications. Dr. Karen brings with her extensive experience in teaching/facilitating of online courses at both undergraduate and graduate levels. Rev. John Porter was a Minister in the Church of the Nazarene for forty-seven (47) years before retiring in 2015. He has served on the Trevecca Nazarene University Board, District Ministerial Credentials Board, District Advisory Board. He has been the District SDMI Chairman, Assistant to the District Superintendent as well as serving in many other community organisations.